Coles meat manager Dave Wilson, who is off work because of wrist surgery, decided it was just as easy to rest up on the doorstep of the burger restaurant as it was in front of a TV. 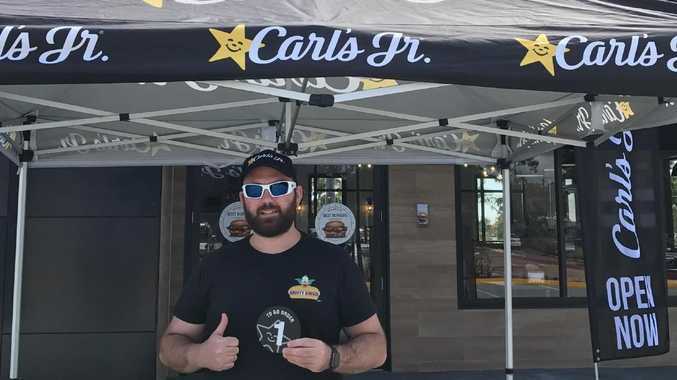 A FAST-food fanatic has made sure he receives free burgers for a year by queuing outside a Carl's Jr restaurant 24 hours before it opens. He turned up at the Eagleby Store, which will be the US franchise's 500th worldwide, ahead of its Saturday launch. The first 50 people through door get vouchers to eat free for a whole year. His overnight kit includes several fully loaded portable chargers, a deck chair, an esky full of food and drinks and some warmer clothes for when darkness falls. Mr Wilson said he was not a fast food junkie but was very partial to Carl's Jr burgers and wanted to get in well before an anticipated after late afternoon rush for the first 50 spots. 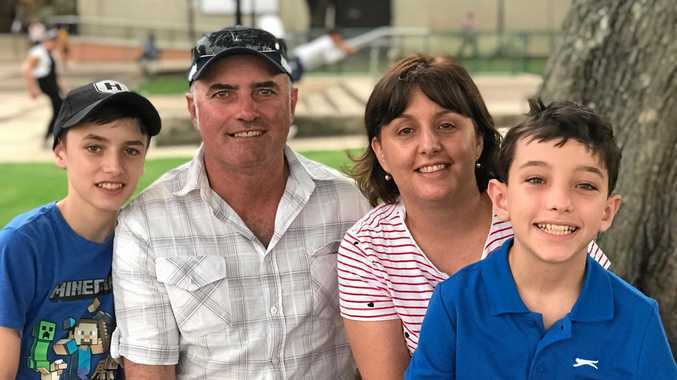 "I'm of work because of surgery so I had the chance to do it and come down and win free burgers," Mr Wilson told The Courier-Mail. "Hopefully someone will turn up soon (for company), but what have seen from previous ones is that do not start showing up until about two or three in the afternoon." The Eagleby store will be fourth Carl's Jr to open in nine months under franchise by Queensland-based Bansal Group. The first to open was at Redbank Plains followed by, Pimpama and West Ipswich. Mr Wilson was given a number to allow him to leave his seat when nature called. "It's a pretty good day to queue and I'll be sticking it out until tomorrow and that's when I'll have a nap," he said. "I've got a jumper and long socks and the chair is comfortable enough to sleep in if I have to but I've got a few Red Bull's to keep me going." The Eagleby outlet will open at 8.30am. The Bansal Group expect the new restaurant in Eagleby to rival, if not surpass, record-breaking opening results in Redbank and Pimpama. The Pimpama store has achieved a position in the top three in global openings for the burger giant. The Bansal Group has earmarked at least another 15 restaurants for Queensland. Rothwell and Hope Island expected to open before Christmas and Slacks Creek, Berrinba, Townsville and Rockhampton slated for 2019.